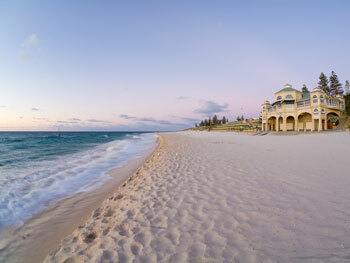 Come and learn English with us in Perth, where you can experience a fantastic contrast of cosmopolitan city life and laid-back beach vibes, all in one place! Perth is often referred to as one of Australia’s friendliest cities, and it’s hardly surprising with 8 hours of sunshine every day of the year! Spend your days soaking up the city’s rich culture at the Perth Cultural Centre, where you can visit the State Library, explore the West Australian Museum, or take a trip to one of Perth’s theatres. 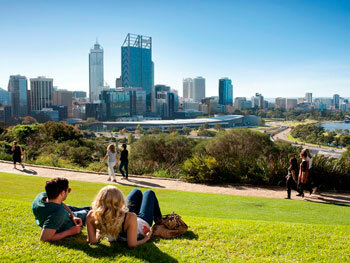 If you prefer to spend your time amongst nature, Perth is also home to beautiful beaches and peaceful parkland, including Kings Park and Botanic Gardens, where you can enjoy Perth’s natural beauty whilst absorbing the relaxed, stress-free atmosphere of the city. 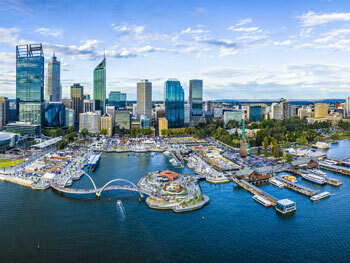 Situated in the cultural district of the city, our school will act as the perfect base for your stay in Perth, with countless things to see and do right at your fingertips. And with such excellent transportation links, exploring the city and its surroundings couldn’t be any easier! Our English school is located in Northbridge, about 1km from the city centre and just a short walk from the Perth Cultural Centre. 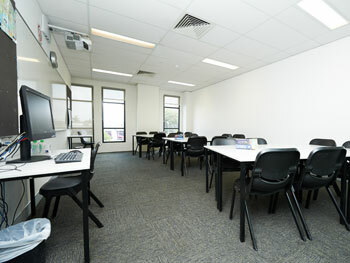 The school itself is located within modern premises, and is comprised of 13 classrooms, a media room with computer access, student lounge, student kitchen and a courtyard. Wi-Fi is available throughout the school building. If you want to learn English but still have plenty of time to explore the city and its surrounding areas, take a Semi-Intensive course of 16 group lessons per week. Or, for a more intensive learning experience, opt for our Intensive course of 20 lessons per week. Semi-intensive and Intensive courses are held in groups of no more than 18 students, with each lesson being 60 minutes in duration. Alternatively, for more personalised learning, opt for a course of private lessons. Private lessons are incredibly beneficial, as they allow a great deal of flexibility and give you the opportunity to target specific areas of study. Your teacher will quickly get to know you and your preferred method of learning and will be happy to cover any specific topics that you have in mind. Whether you want to improve pronunciation, written expression, spoken fluency or something completely different, you will improve your weaker areas in no time! We also offer preparation courses for students studying for the IELTS examination. The course includes 20 lessons each week and is geared towards helping students pass this specific exam. Stay with an Australian host family for a unique cultural experience! Host family accommodation allows you to practise your English skills in a warm and welcoming environment with native speakers of the language, whilst having a wonderful insight into the daily life of an Australian household. Choose the self-catering option for a more independent experience, or half-board to immerse yourself fully into the language and culture. Half-board includes two delicious meals per day with your hosts, giving you the perfect opportunity to use your English skills in an authentic context. Experience Australian life first-hand with the help of our school’s activities club. Explore new places, learn new skills and make friends from all over the world – all whilst practising your English skills! Activities include day trips and weekend excursions, surf camps, sports activities (biking, hiking, etc), cultural activities, social activities (coffee afternoons, dinners, BBQs, etc) and so much more! 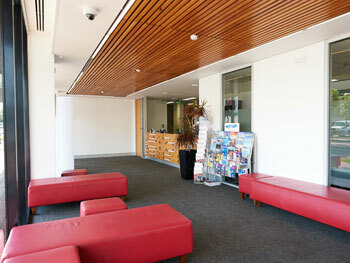 Optional airport transfers can be arranged from Perth airport, which will take you directly to your accommodation. Please note that the transfer service is not included in the cost of the programme and will incur an additional fee. Please contact us for more information.